Yes you can have free art lessons. These are most readily available over the Internet and in art magazines. In my experience what is on offer online varies greatly. Some offer clear and helpful, step by step instructions with excellent illustrations. The best advice I can give is to read the steps through slowly and carefully before starting. If you are unsure about any stage or technique then if possible contact the artist or try this technique before attempting the whole picture. Art magazines such as The Artist often provide step by step art lessons. If you are inspired by such an article then read it through carefully and check you have the correct materials. These free are lessons can be very enjoyable and educational. However as you are creating a work based on another artists painting please do remember you will not be able to sell it. Please do not break copyright rules. 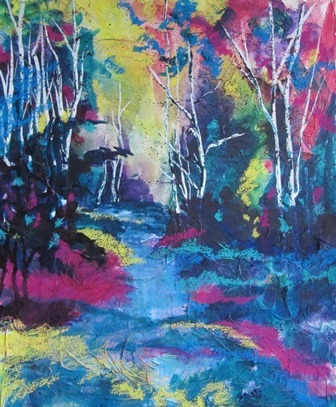 Try a mixed media field painting.